Since his recognition year, Michael has advocated for increased teacher professional development and training at the local, State and National levels. His personal passion is helping teachers to develop creative, authentic and valid assessments for learning. Improving education for Michael means transforming assessment stressors for teachers and students into exciting new tools to make classrooms more emotionally safe for all. Likewise, Michael believes in challenging his own students and giving them the honesty they deserve. “Teachers don’t need to be cruel to maintain professional boundaries, nor are we our student’s friends,” he explains. Helping students to understand how they learn best may sound simple, but Michael says that it’s a demanding yet essential task to provide the best possible experience to all students. Michael is a science teacher in Omaha, Nebraska. He was selected for the Knights of Aksarben Teacher Leadership Award in 2008 and Nebraska Teacher of the Year in 2010. Michael has been a Westside High School teacher since 2003. He is a biology and natural sciences instructor and is the Natural Sciences Team Leader. He has a Masters degree in Secondary Teaching with a Biology Endorsement and an Assessment Leadership Endorsement. 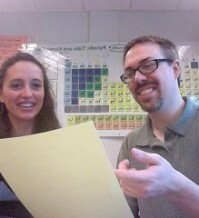 He is currently working toward his Ph.D. in Science Education and Assessment.